Call time on Friday was 10:00 am, which meant a day off from class for some of our bandies, though that didn’t stop some of us from getting some work done on the bus. 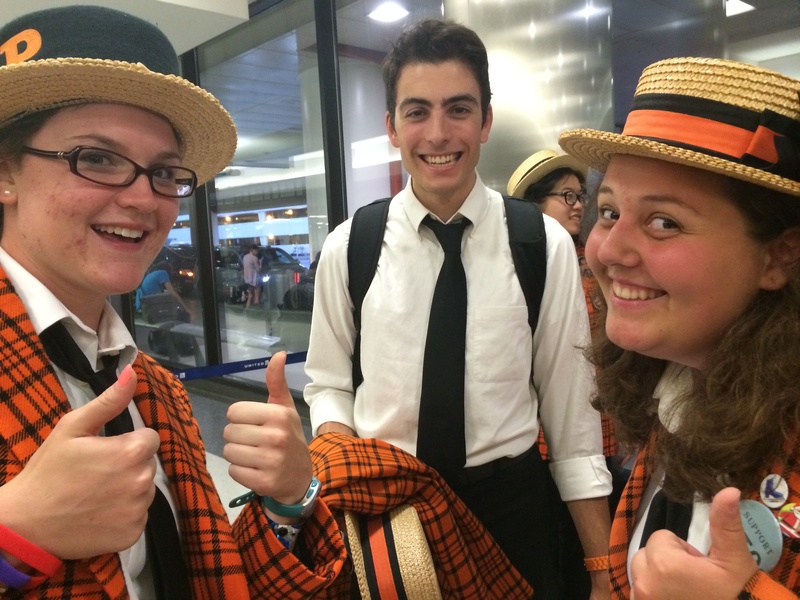 We went incognito in the Newark and San Diego Airports–no one will ever notice the sea of orange plaid at Gate 72. 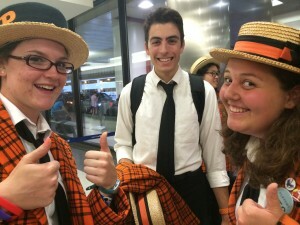 Megan Kennedy ’15, Dennis Smith ’16, and Rachel Marek ’17 smile for the camera while waiting in baggage claim. 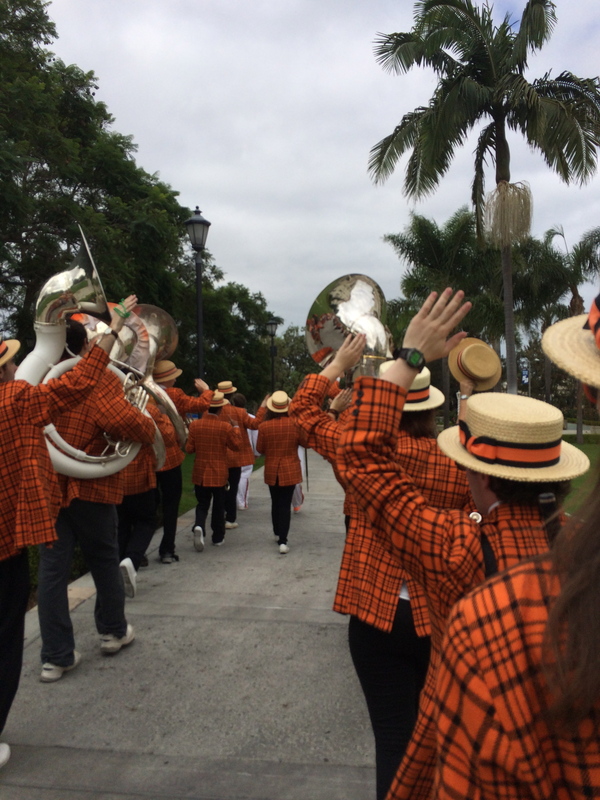 The next day, we donned our boaters and marched around the University of San Diego’s campus, clashing with the mission-style architecture and getting kicked out of the university store before we could even finish our rendition of “Tequila”–how rude! 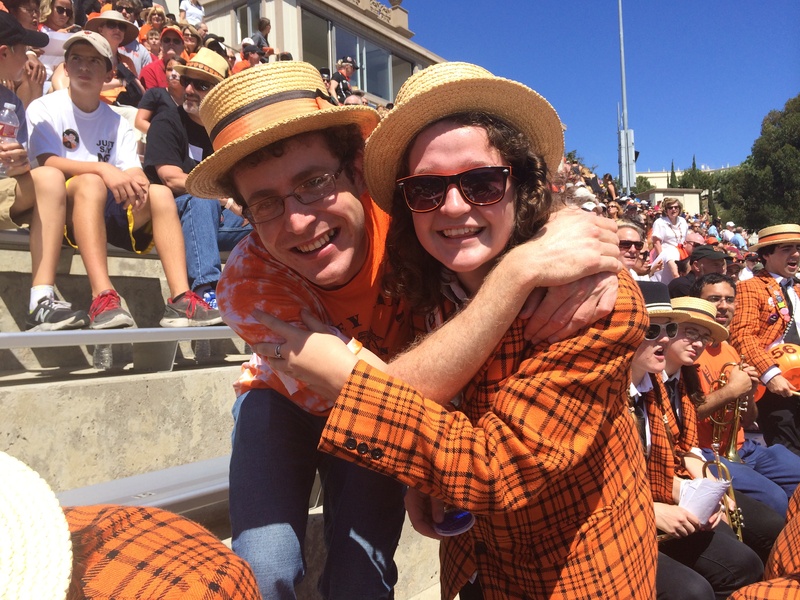 Cheering on our Tigers, the Band took to the stands and then to the field for our first halftime show of the season! 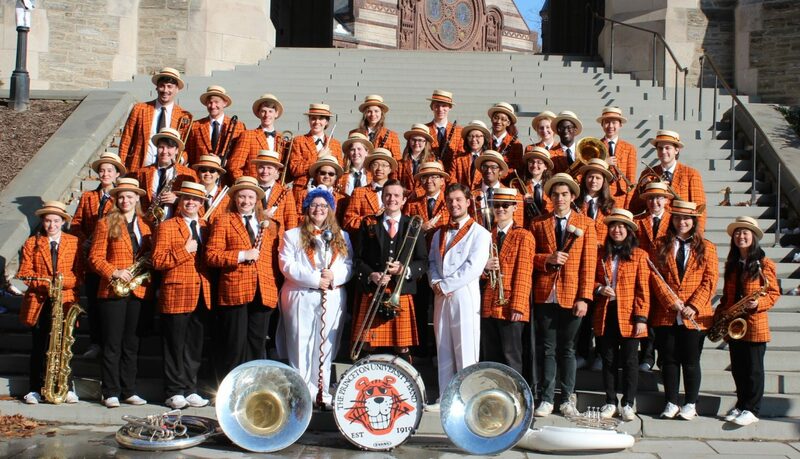 Although the team lost, the Band took consolation in the fact that they won be default: the other school’s band didn’t exist, let alone show up. 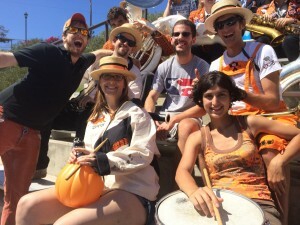 A number of lovely Princeton alumni who live in California showed up to play with us. Nice to see you all! 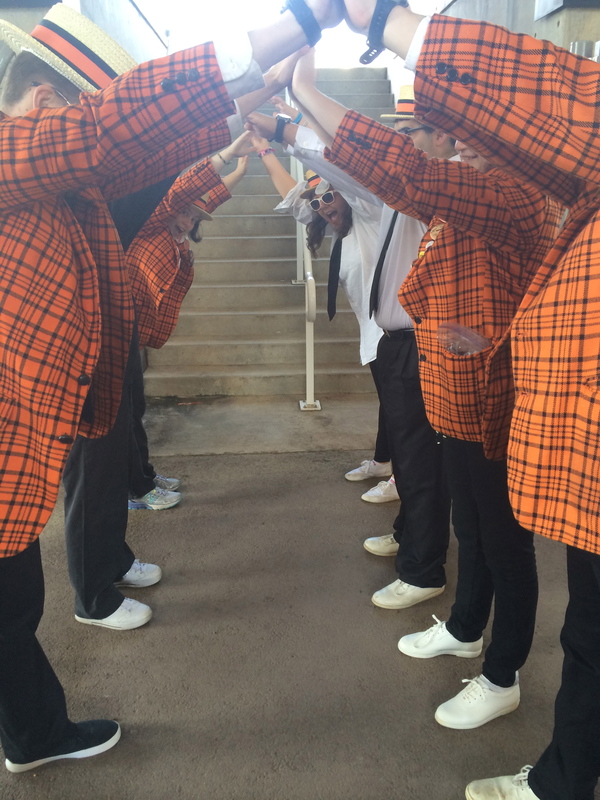 We’ll be back in ten years! 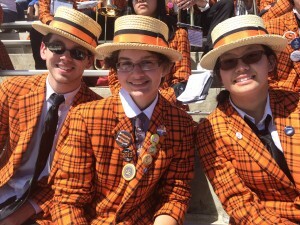 The alumni contingent of the Band at San Diego! Joseph McMahan ’13 and Angeline Jacques ’16 reminisce about Joseph’s days as drum major. During our downtime on Saturday evening, we enjoyed some fun in the sun as the Band hit the San Diego sand. 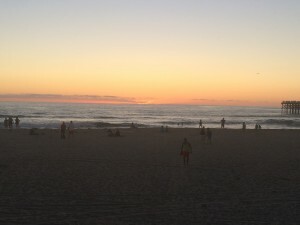 We arrived just in time to enjoy the beautiful California sunset! 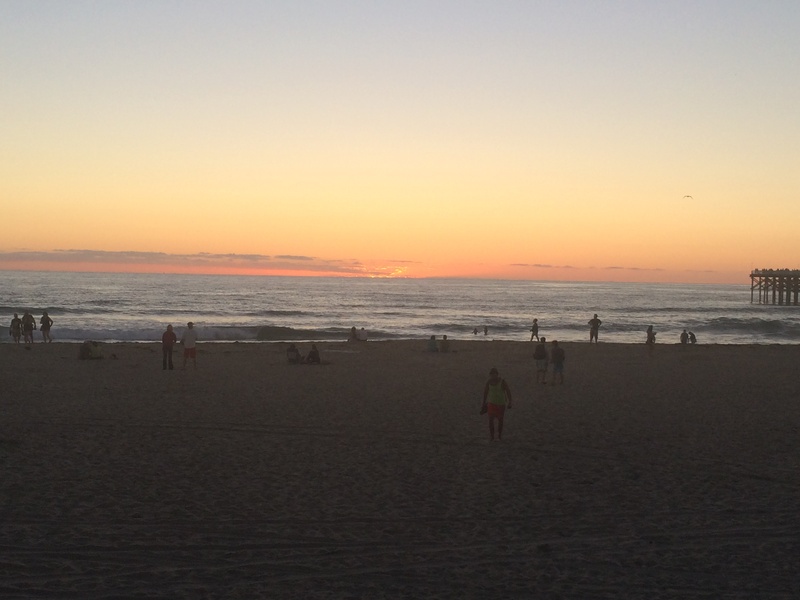 The sun sets on our weekend retreat. 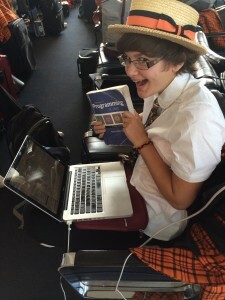 But the trip wasn’t over yet! On the flight back to New Jersey, the Band discovered that one of its alumni was on the plane…actually, he was flying the plane. Shout out to Michael Niggemann Niemann ’90, a former member of the illustrious trash percussion section! Thanks for getting us back to New Jersey safe and sound! 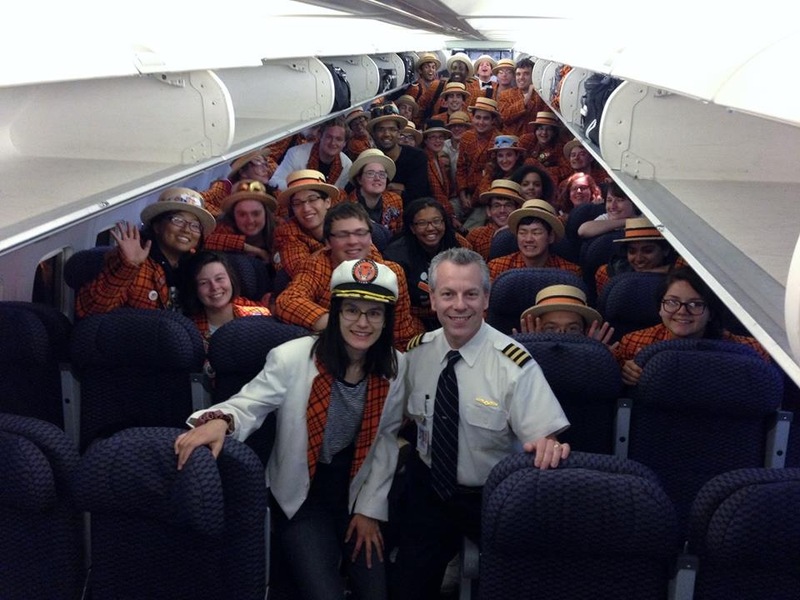 Mary Gilstad ’15, Michael Niggemann Niemann ’90, and the Princeton Band at large pose for a photo on the plane home.